In 2002 Ken and Doris Taylor made the first of five visits to Haiti. I was invited to join them for the third visit in January 2004. Most of the earlier Scripture-text distributions were done in the area of the capital, Port au Prince. During that trip we had a particular desire to visit the town where I spent the first ten years of my life, Saint Michel de l’Attalaye. A teacher/schoolmaster was saved as a result of that visit. Due to health limitations, the Taylors were not able to go this year but brother Taylor called me last fall to see if I was exercised about another trip to Haiti. A similar interest developed with Matthew Scott of Vancouver, BC, who had participated in earlier visits. My younger brother Rubin became exercised about joining us. Matthew met us in New Jersey Thursday evening. The next morning, brother Curran from the Pennsauken assembly drove us to the airport. We flew from Philadelphia to Miami to Port-au-Prince, Haiti, then to Cap Haitian. We spent Friday night at a hotel in Cap Haitian. Saturday morning, we hired a vehicle and driver and left for Saint Michel. At Saint Michel, we learned brother Olibris’ mother died before we arrived. He also had difficulty finding us a place to rent, but the Lord brought us into contact with Yvon, my cousin, who opened his home to us. I tried refusing, but he insisted. I mentioned Yvon’s invitation to Matthew and Rubin, and Matthew thought it was our best option. We accepted Yvon’s hospitality. He and his family gave us the best room and beds in the house; his wife and sister-in-law prepared delicious Haitian dishes for us. Yvon accompanied us during text distributions and open air meetings. When responsibilities prevented him, his younger brother Markenson or Kerfie, a mutual cousin, accompanied us. Sunday through Tuesday, we visited homes with texts, giving brief explanations to people who asked for one, and held several open-air meetings each day. One particular meeting remains with me. It was Monday or Tuesday afternoon. Rubin and Matthew went ahead distributing while Yvon, Kerfie, and I stayed behind, giving texts to people we nearly missed. People from a group of homes built beside each other wanted a short word in the gospel. Chairs were brought out, others gathered while we sang. While the gospel was being preached, many more came out to listen, older ones, teenagers, and children. There was even a woman with a newborn in her arms. What drew them, I believe, was hearing that eternal, unconditional forgiveness was offered to them freely through Christ, not a reward for walking the straight-and-narrow. No profession was made, but, from their earnest faces, I want to believe God was working. Wednesday afternoon was the funeral for Mr. Olibris’ mother. After the Cathedral service, we followed the limousine to the cemetery where Matthew preached to many people. Matthew’s calm preaching made it easy for the people who didn’t speak French to understand him. During the procession, I made the acquaintance of a brother named Mr. Seraphin; we discussed salvation and church truths. Mr. Seraphin was excited to have basic gospel and assembly truths expounded to him from Scripture. After the funeral, he accompanied us to a soccer field where we held regular meetings at 5:00pm. Thursday morning, Yvon and Kerfie took us to Ravin Pwadou, where Rubin and I were born. A pick-up truck cut our four-hour trip in half; we walked the remaining two hours, the road being inaccessible by car. We gave texts to many women traveling to the market. Rubin and Matthew preached to some men we met along the way. We arrived in Ravin Pwadou late. Our relatives gathered and we greeted them. Rubin opened with a gospel message. I shared my testimony and Matthew closed in prayer. They had questions for us and I believe we answered them to their satisfaction. The car would be coming for us soon so the people gathered, we took their pictures, and we hurried away. We made it back to the business center of Saint Michel in time to hold our regular meeting at the soccer field. Mr. Seraphin invited us to his house Saturday at 4:00pm to speak to his neighbors. Saturday we distributed texts and held open-air meetings, then went to Mr. Seraphin’s place with Kerfie as our guide. Many of the people the brother invited had plans but his daughter and friends were there. More people gathered together once singing started and we preached the gospel. Afterwards, Mr. Seraphin met us at the soccer field and we preached to a group of children. Mr. Seraphin invited us back to his house Sunday for some questions. Tuesday, we spent some time with Mr. Olibris at Yvon’s. Due to Mrs. Olibris’ death and school opening the Monday following her funeral, he didn’t spend much time with us. Mr. Olibris did have us speak with his ninety-one-year-old unsaved father, which we did Wednesday, the day before we left. We spoke with Mr. Olibris Sr. about the new birth, then Matthew and I shared our testimonies. Mr. Olibris said he wanted salvation but didn’t know how to get it. Before we left, he said our testimonies were a help. Thursday, Yvon, Markenson, and Kerfie accompanied us to Cap Haitian. When we got there, Matthew wasn’t feeling well. Rubin and I went distributing in a town located on a mountain not far from the hotel and then at the seaside. We appreciated the Lord’s preserving hands, His bringing us in contact with certain people, and special help given in the gospel. No doubt it was due to the many believers praying. We are, therefore, grateful to everyone who labored with us in this way, the Taylors especially who devoted much time and resource toward the visit. Please keep praying for the work in Saint Michel. 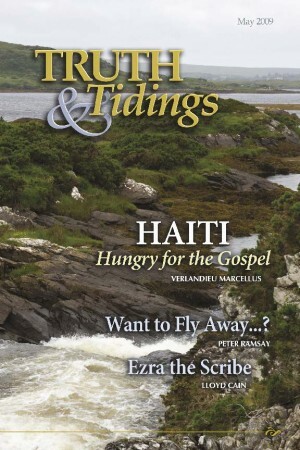 The Haitian people are hungry for the gospel. Pray that the Lord will plant an assembly there where the clear gospel will be disseminated.